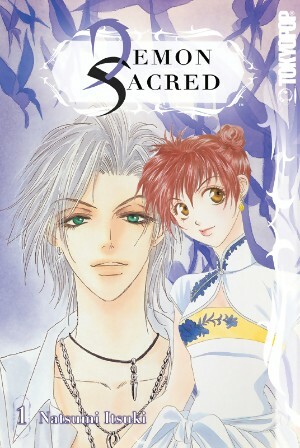 Demon Sacred is shojo manga’s answer to the everything bagel, substituting hot scientists, dragons, pop idols, twins, secret government research facilities, and time-traveling aliens for garlic chips and sesame seeds. That such an unlikely combination of ingredients proves complimentary is nothing sort of miraculous — it’s hard to imagine how rock stars and rifts in the space-time continuum could co-exist in the same manga without the whole enterprise descending into complete silliness, but Natsumi Itsuki walks the fine line between stupid and clever with the grace of a high-wire acrobat. Consider the first three chapters of the series: in them, we’re introduced to Rena, the sole survivor of an incident involving unicorns; her fourteen-year-old daughters Rina and Mona, one of whom has developed a disease that causes her to age backwards; and the girls’ guardian Shinobu, a handsome, pony-tailed researcher who is toiling away on a cure for Return Syndrome and — natch — earned a PhD from Harvard before his eighteenth birthday. Those three storylines alone provide ample material for a good shojo fantasy, but Itsuki cranks up the narrative nuttiness to eleven in subsequent chapters, tossing in a handsome “demon” — in fact, a shape-shifting alien from another dimension — who knew the twins’ mother, and a second, more powerful demon who assumes the form of the girls’ favorite pop singer. A cynic might dismiss these additional characters as pandering to teen girl taste, but Mika and K2 serve an important role in advancing the plot, shedding light on Rina and Mona’s past (Mom disappeared when they were four) and offering a potential cure for Rina’s condition. Ditto for some of the comic-relief episodes, in which K2 impersonates a real-life idol; if Itsuki always played it straight, the story would seem positively ludicrous instead of charmingly overstuffed. Remember, the opening pages of the series involve a stampede of unicorns emerging from the aurora borealis and trampling a group of tourists in the Finnish countryside. Even Madeline L’Engle didn’t have the guts to try that. I’d be the first to admit that Demon Sacred isn’t as well constructed as Itsuki’s Jyu-Oh-Sei, a tight, logical exercise in hard science fiction; if anything, Demon Sacred feels freer and messier than her earlier work. That impression of spontaneity stems from the casual way in which Itsuki assembles plot elements, like a chef rummaging through the refrigerator and grabbing whatever looks appetizing. There’s no obvious rationale for inter-dimensional, time-traveling aliens to assume the form of mythical Earth-beasts, other than the fact it tickled Itsuki’s authorial fancy. Yet that kitchen-sink quality is a big part of Demon Sacred‘s appeal; I’d be lying if I denied my pleasure in seeing a character quote from the Book of Revelations, or imagining a universe in which griffins, unicorns, and fire-breathing dragons could assume the form of popular singers. It’s hard to guess how Itsuki will resolve the myriad subplots introduced in the first two volumes, but the story unfolds in such a feverish, urgent fashion that it’s easy to forgive the occasional narrative shortcuts or capitulations to shojo convention. (See “hot young scientist” and “pop idols,” above.) Demon Sacred may not be the best new manga of 2010, but it’s a strong contender for most addictive. Review copies provided by Tokyopop. I was going to pass this up but you’ve convinced me to give it a try. Hopefully I find it as fun as you make it sound. Please let me know what you think of it, Eric! I’m glad you’re man enough to give it a try. Got the first two volumes today and I enjoyed the story the longer it went on and I’ll definitely check out the third volume but unless it really wows me I’ll probably drop the series. It’s good and some of it is kind of interesting but I wasn’t particularly pulled into either when I was reading it.